MySQL Certification lays the foundation for becoming a trusted and valuable resource for your company and customers. MySQL certifications are available for Developers, DBAs and for those specializing in MySQL Cluster technologies. Smart consultants, developers and DBAs use MySQL certification to show prospective employers and customers that they are up to date on the latest features, gain confidence that they are on top of MySQL tools and tricks, promote themselves with certification logos on business cards, personal weblogs and job interviews and demonstrate that they can apply their skillset in a business environment. 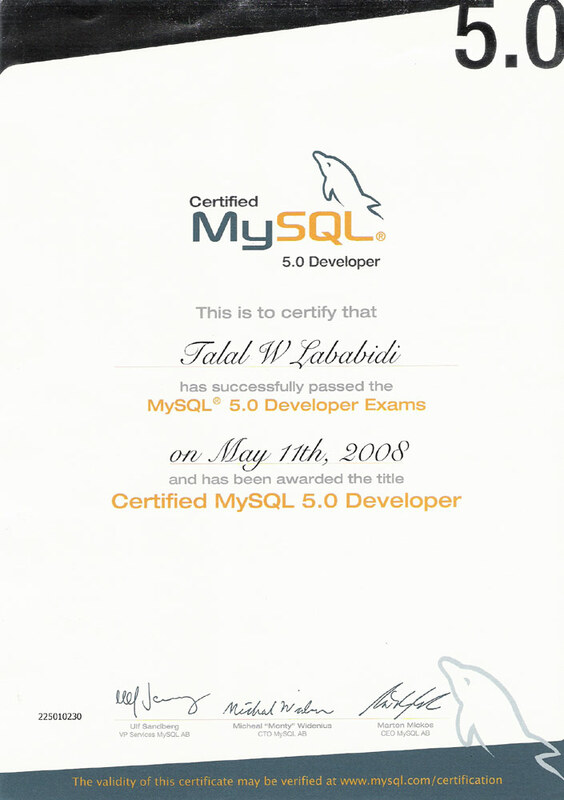 Effective employers and managers use the MySQL certification program to shortlist candidates and quickly gain a selection of pre-qualified candidates for a job position, validate their investment in MySQL training of their employees, establish a common base of knowledge and skills for project members before embarking on a new task and may use the fact that they retain certified personnel in promotional materials. Candidates should carefully review the Non Disclosure Agreements and Logo Usage Agreements for the English and Chinese & Japanese examinations before registering for any exam. * Associate (CMA) Certification is an entry level certification that is attained by passing a single exam. * Developer (CMDEV) and DBA (CMDBA) Certification is available for MySQL 5.0 and is attained by passing two exams. * MySQL Cluster certification for MySQL 5.1 is attained by holders of the CMDBA certification by passing a single exam and is not version specific. All exams are administered through one of more than 3,000 Pearson VUE testing centers available world-wide. An individual holding the Certified MySQL 5.0 Developer (CMDEV) or Certified MySQL 5.0 DBA (CMDBA) certification has extensive and broad competentences in his or her field of expertise. Each certification focuses on specific application areas, expertise, and job skills. The CMDEV certification is targeted at candidates who will be developing applications that use MySQL as back-end storage, whereas the DBA certification is targeted at candidates who will take the administrative role of tuning, planning, and optimizing data layout for one or many servers, but do not write many applications. Neither of these certifications implies an advancement level over the other. Rather, each certification covers a distinct area of expertise, aimed at different job roles. Candidates should choose to study for the certification that best suits his or her current or aspired professional position. Some candidates follow both tracks to become an all-round MySQL professional.